On a blistering hot day during the Battle of Monmouth, New Jersey, young Mary Hays McCauley became Molly Pitcher in American Legend. 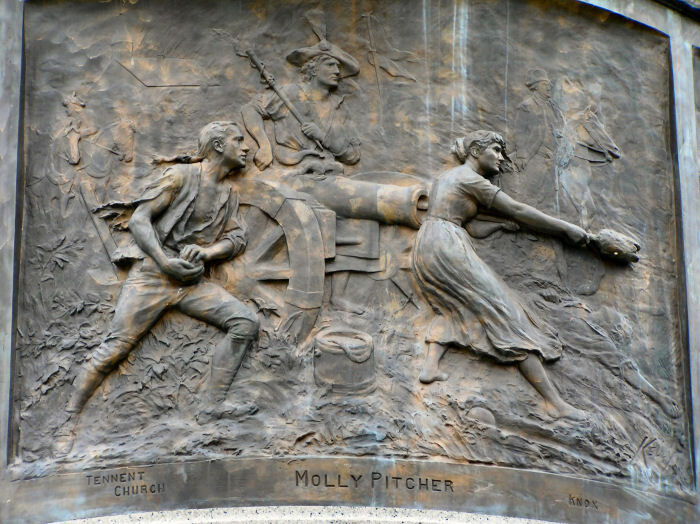 Molly Pitcher was a nickname given to a woman said to have fought in the Revolutionary War. The story of Mary Ludwig Hays McCauley is considered folklore by historians, or they suggest that Molly Pitcher is probably a composite of a number of real women. The name itself may have originated as a nickname for women who carried water to men on the battlefield. It has also been suggested that the story of the cannon also applies to another brave woman named Margaret Corbin, but both accounts could be true. Mary Ludwig was born on October 13, 1744, on a small farm near Trenton, New Jersey, to a German family. She grew up there and helped her father, who was a dairy farmer. She was raised to be a hard worker, and as typical hardworking farm girl—heavy-set, strong, and sturdy—she could do all the chores and tasks that a small farm requires. At the age of thirteen, Mary Ludwig was hired by a Mrs. Irvine of Carlisle, Pennsylvania, who wanted a young girl to help with the housework. Mary lived with Dr. and Mrs. Irvine for many years, and it was there that she met her future husband, John Casper Hays, a young barber who lived in the village. On July 24, 1769, Mary Ludwig married John Casper Hays. Their only child, Johanes Ludwig Hays, was born in 1783. In 1775, John Hays enlisted in the First Pennsylvania Artillery as a gunner. Mary, not wanting to be separated from her beloved John, went with her husband to war, which was not unusual at the time. Mary was probably with him through his entire military experience, since records show that she was at Valley Forge from December 1777 through June 1778. Mary nursed the sick and helped by cooking, washing and sewing. 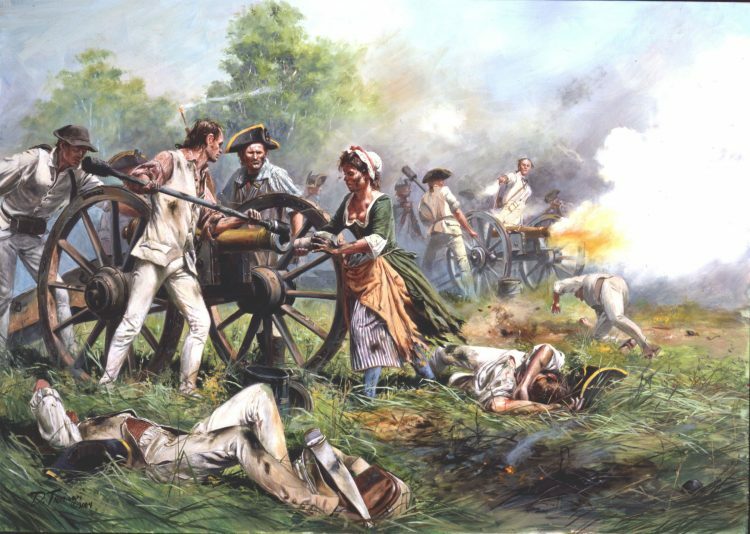 On Sunday, June 28, 1778, the Battle of Monmouth, New Jersey, was fought on a very hot day, with temperatures approaching 100 degrees. To help the soldiers, Mary carried water from a nearby spring to the thirsty men on that hot and smoky battlefield. The water was also used to cool the blazing cannons. She soon gained the nickname Molly Pitcher. Relations between the Thirteen Colonies and Great Britain slowly, but steadily worsened after the end of the Seven Years’ War (1756-1763), which involved all of the major European powers and caused 900,000 to 1,400,000 deaths. The war had plunged the British government deep into debt, and the British Parliament enacted a series of measures to increase tax revenue from the colonies.